Brown the Scotch fillet on all sides in a dash of oil in a hot frying pan. Transfer to a chopping board. 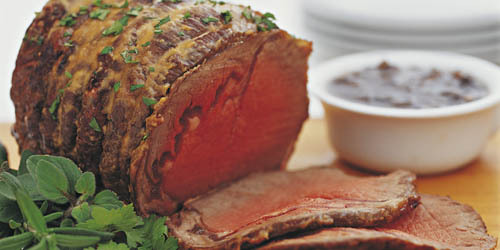 Mix together the horseradish cream, mustard and brown sugar and spread this mixture on the top and sides of the meat. Place on a foil-lined baking tray. Place in 220°C oven and then turn down immediately to 200°C and roast for 40 minutes. Set aside to rest for 10 minutes before carving and serving with Mushroom sauce, Roast Potatoes and freshly steamed vegetables. Cook the onion in a dash of oil in a saucepan over a moderate heat for about 5 minutes until softened. Add the garlic and cook for a further minute. Stir in the port or sherry and simmer until reduced by half. Add the beef stock, chopped mushrooms and mushroom sauce. Simmer for 10 minutes. Peel the potatoes and place in boiling salted water. Bring to the boil and boil for 5 minutes. Drain and return to the saucepan. Shake the potatoes over the heat to rough up the outside edges. Alternatively, use a fork to score the outside of the potatoes, so that the edges are rough. Roll the potatoes in the oil so that they are evenly coated and place on a baking tray. Cook at 200°C for 15-20 minutes until golden.